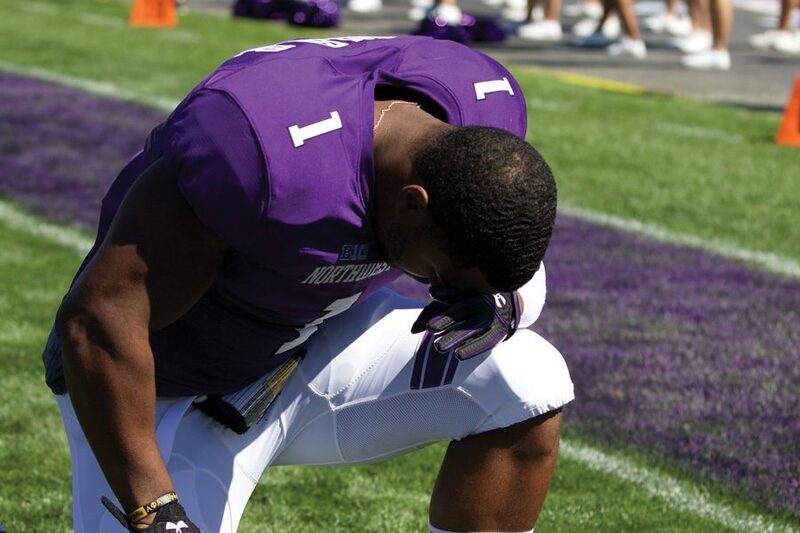 Anthony Walker kneels before a game. Walker announced on Friday through a tweet that he will enter the NFL Draft. Anthony Walker will forgo his final season of eligibility and enter the 2017 NFL Draft, the junior linebacker announced via Twitter on Friday. The three-year starter was a key defensive player on Northwestern’s 10-win 2015 team and Pinstripe Bowl-winning team this fall. Walker recorded 105 tackles and forced four fumbles this season, including one in Wednesday’s bowl victory. After redshirting as a freshman in 2013, Walker broke out in 2014 with an eight-tackle game against Penn State, and went on to start seven games. His sophomore season was his finest season statistically, as he rounded up 122 tackles and 20.5 for loss en route to consensus first-team All-Big Ten Honors. After the Pinstripe Bowl, Walker said that he had not made a decision regarding the draft and was going to consider “all the information” he needed. In his announcement on Twitter, Walker said that he hoped to fulfill his dream to play in the NFL. “I came to Northwestern to get a great education and play football at the highest level. I was able to do both,” Walker said. NU still awaits the decision of safety Godwin Igwebuike, another junior who is thought to have NFL prospects and might enter the draft. The deadline to declare for the draft is Jan. 16.